Cozumel Mexico is a tropical paradise in the Mexican Caribbean. The island is a major destination for regional tourism, particularly for scuba divers and cruise ship passengers. 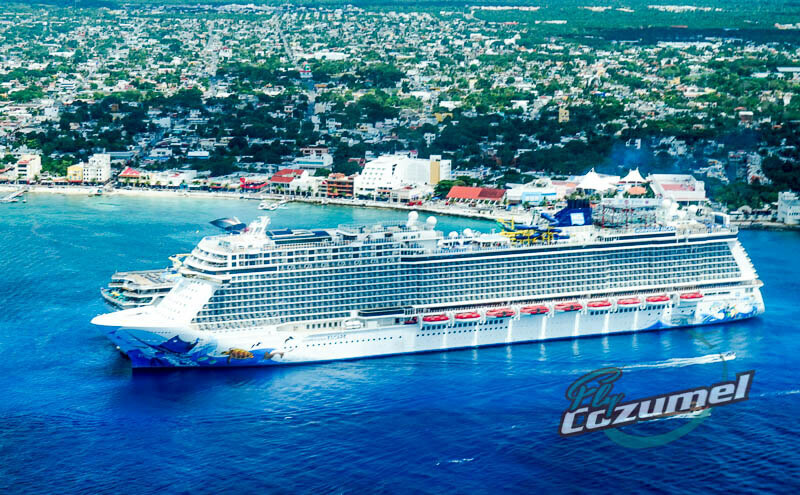 In fact, Cozumel Island receives almost one million passengers a year just from cruise liners such as Royal Caribbean, MSC, Carnival, Norwegian Cruiselines, and Disney. But what makes this island so special and where is it anyway? The island of Cozumel has been inhabited for over 2,000 years. According to the latest census on the island, Cozumel has just over 85,000 inhabitants. The town’s center, known as San Miguel, is where most of the tourism business is located, including restaurants, bars, dive shops, and stores. 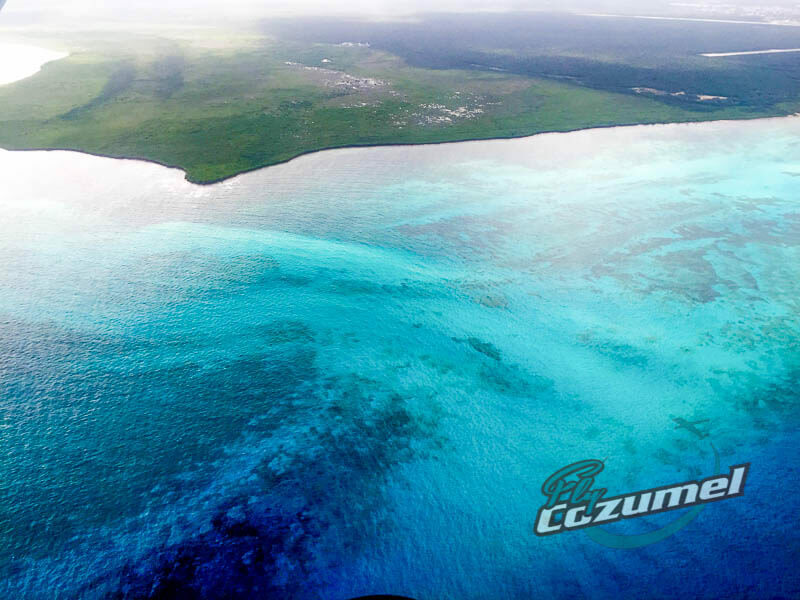 Cozumel is located in the Mexican Caribbean at 20°25′N86°55′W to be precise. Located 12 miles from the mainland, the island is about 30 miles long and 10 miles wide making it the largest island in the Mexican Caribbean and the third largest in Mexico. 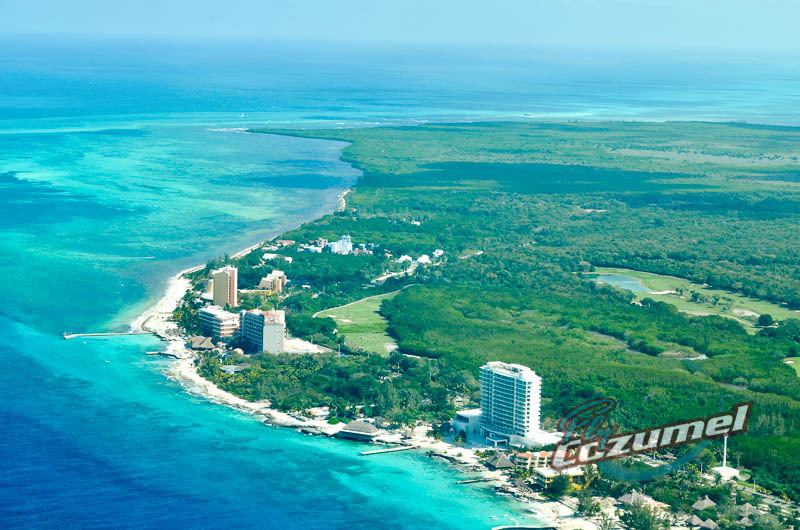 Home to the Cozumel International Airport, it is possible to reach the island by plane or from a Playa del Carmen ferry. #2 Can I fly into Cozumel airport? As mentioned, the Cozumel airport is an international hub and receives direct flights from several U.S. cities. While most people will find it easier to book a ticket that flies into Cancun International Airport, you can still find flights to the other through several major international airlines as well as Cancun charter flights from companies such as Fly Cozumel. Which airlines fly to Cozumel Mexico? 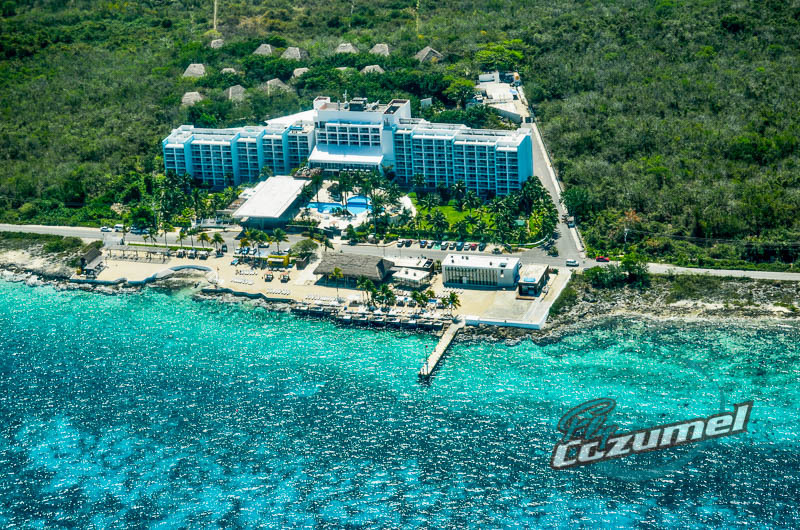 American Airlines, Delta, Frontier, and United all have year-round flights to Cozumel. Please be sure to contact our Fly Playa crew if you’re looking to arrange a Cancun charter to/from Cozumel. #3 What’s Cozumel weather like? Sometimes humid. Really humid, especially during the summertime. 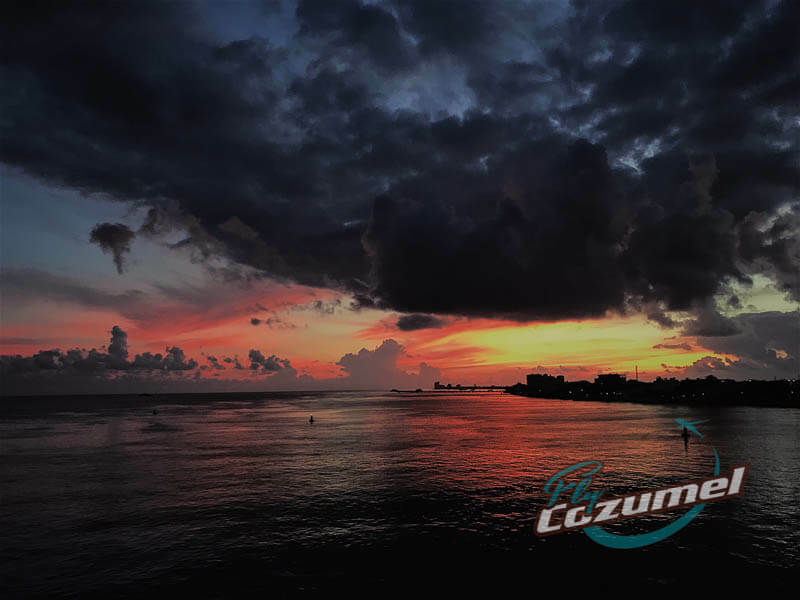 Cozumel weather averages highs between 83º and 91º Fahrenheit with average lows — brace yourselves — between 67º and 74º Fahrenheit. No, it’s never cold in Cozumel. Rainy season typically runs from about June through October. 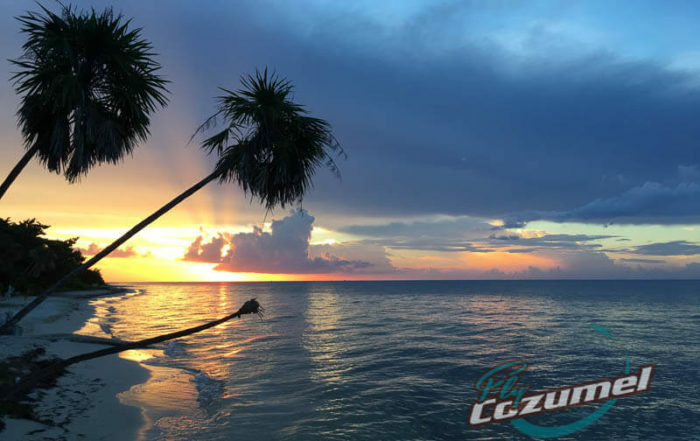 However, when researching your Cozumel vacation be sure to take into account that weather predictions aren’t reliable more than a few days out and that when you see rain in the forecast, which could be most days, be sure to look at the amount of precipitation. It’s common that we get a brief shower or storm that passes over just as quickly as it appears. Check out this article for a great summary of neighboring Playa del Carmen weather, which is very similar to ours on Cozumel. #4 How do I get from Cozumel to Playa del Carmen? Right smack dab down the road from the Cozumel cruise port you’ll find the ferry to Playa del Carmen. The journey takes about 45 minutes and runs every hour from 7:00 a.m. until 10:00 p.m. 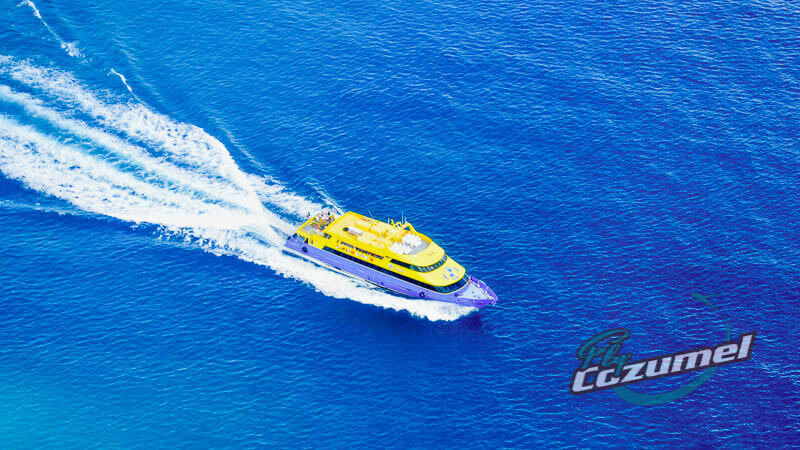 There are three different options for a ferry to Playa del Carmen: Ultramar, Mexico Waterways, and Barcos del Caribe. Prices can vary between the ferries but if you’re looking for quality and comfort we recommend that you stick with Ultramar. For more information on ferry times, be sure to check out the Ultramar ferry schedule. From Playa del Carmen, Cancun lies about one hour by car to the north and Tulum is located just one hour to the south. #5 How safe is Cozumel Mexico? 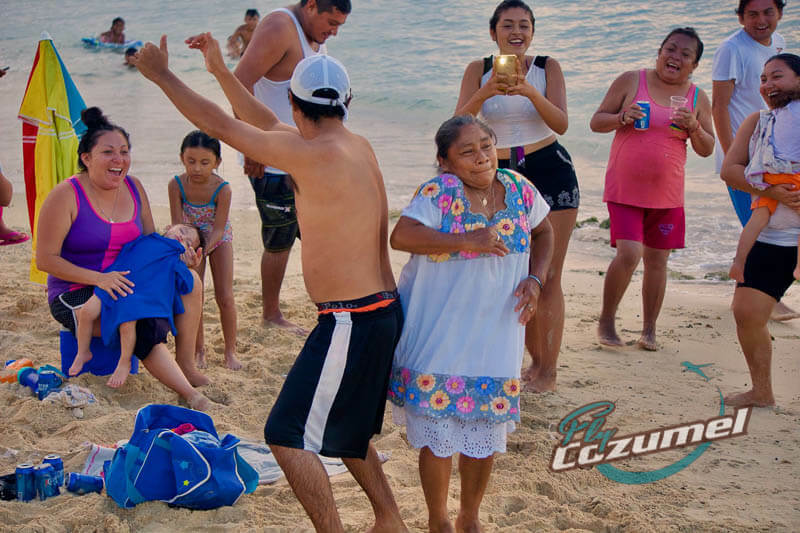 You’ll easily fall in love with Cozumel and one of the main reasons is the friendly and laid-back nature of the people. This is island life here, and things move accordingly. It would be imprudent to say that safety is not even an issue because it is anywhere, but you’re much more likely to be assaulted by a timeshare salesmen at the airport or have one too many shots of tequila than ever having a reason to worry about safety in Cozumel. That said, however, always use common sense wherever you are in the world and while in tourist areas don’t be flashy. In other words, leave the fancy watch at the hotel or on the cruise ship and your passport as well. A copy is more than enough. #6 What are the best Cozumel cruise excursions? When looking at Cozumel shore excursions, the first and foremost factor is time. Most ships dock early and demand that passengers be back on the ship mid-afternoon. Normally, you’ll be off the ship sometime early morning and have to be back on board by in the mid to late afternoon. 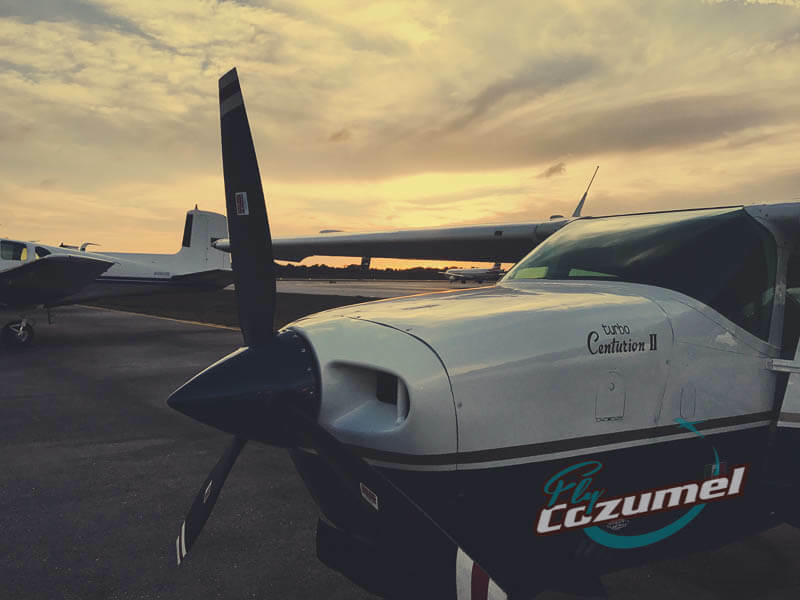 If you ask us, of course, we’re partial to our Cozumel tours by airplane. This is the only way to visit the Mayan ruins of Chichen Itza from Cozumel and be back on time without suffering from long bus rides and barely making it. That’s our most popular Cozumel cruise excursion by far. 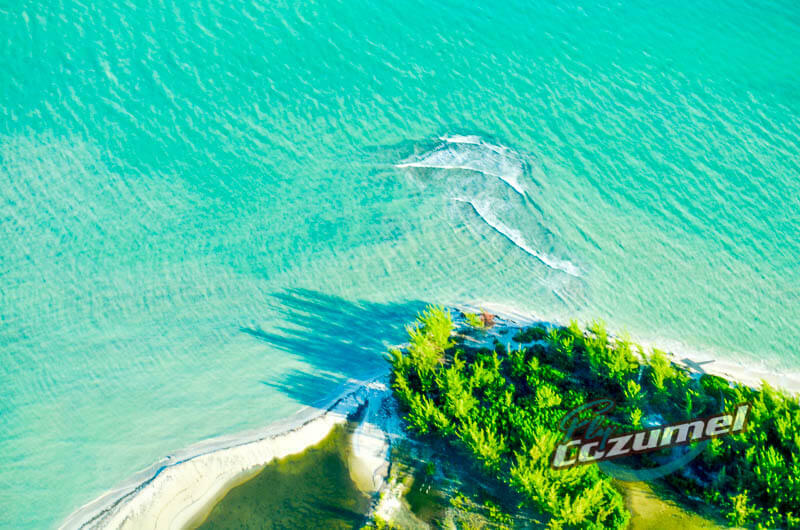 We also offer a scenic flight over Cozumel and a Holbox charter trip to visit the charming island in the Gulf of Mexico. In addition, we also highly recommend going spearfishing in Cozumel, which is such a unique an authentic experience. Plus, the team at Spearfishing Today is great, and with their philosophy of “From Sea to Table” you’ll also get to eat what you catch. For more ideas be sure to check out our top 10 recommendations for Cozumel shore excursions. And if you’re traveling on one of the Liberty ships, be sure to check out our Royal Caribbean tours page. #7 Can you recommend some good Cozumel hotels? There are so many and personal taste and style are always so important that it’s hard for us to be the judge. What’s important is that you know what type of traveler you are. 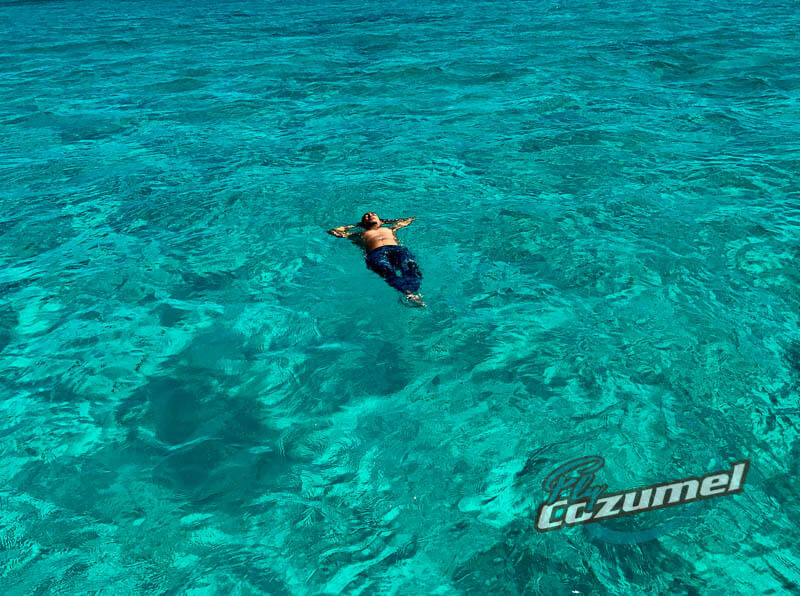 Do you prefer to kick back, relax, and do absolutely nothing (other than a Fly Cozumel excursion, of course!)? Then perhaps you’d prefer an all-inclusive Cozumel resort so that you have everything you want in one place. Are you more adventurous and like to seek out and explore new sights, tastes, and aromas? Then choose a hotel according to your budget that will allow you to do exactly that. Of course, for those who want to feel more like a local and even have your own place to cook a meal, there are a lot of great Cozumel Airbnb options. Some hotels we suggest you consider include Presidente Intercontinental, Westin Cozumel, and Fiesta Americana / The Explorean Cozumel, among others. #8 What Cozumel beaches do you recommend? Cozumel Mexico is stunningly beautiful and it’s so hard to pick just one. It would be like asking a mother to pick her favorite child. That said, there are some great beaches in Cozumel that make for a spectacular few hours in paradise? Playa Palancar is a beautiful stretch of beach that puts into perspective the term tropical paradise. Chankanaab National Park is a great place to go if you’re looking to combine some me time on the beach with some amazing Cozumel snorkeling. Paradise Beach is another great option albeit it can be quite crowded at times. A great place for the entire family! And if you’re looking for the best beach for snorkeling in Cozumel, look no further than the Money Bar Beach Club. On the east side of the island you’ll also find some incredible views and great beaches at the Hotel Ventanas al Mar and the spectacular Punta Morena Beach Club. #9 Are there any good Cozumel restaurants you’d recommend? More than mere sustenance, food expresses culture, community, history, and traditions. 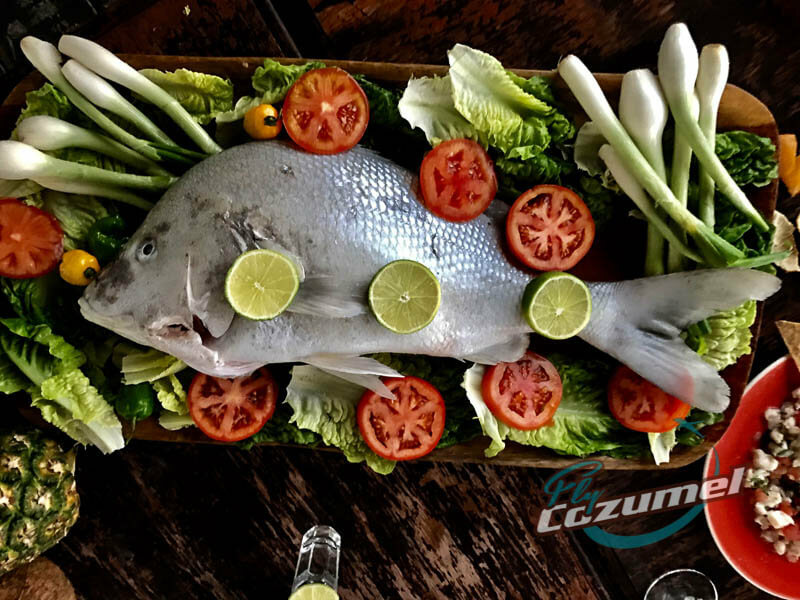 Of course, you’ll find so delicious, fresh seafood in Cozumel as well as a rich mixture of international cuisine. In fact, because there are so many ship workers from Asian countries, you’ll even find the best Asian food in Cozumel Mexico then anywhere else in the entire region. There are too many to choose, but you won’t go wrong with places such as Buccano’s, Kondesa or Guido’s, El Palomar and Del Sur to name just a few. #10 What are some other fun things to do in Cozumel Island? “ So throw off the bowlines,” he continued. Listen to the wise words of Mr. Twain. But what does that mean when speaking of things to do in Cozumel? Explore the island. Interact with the people. Try new food. Practice your Spanish. See new sights. Cozumel is truly beautiful, and it’s a place that is just waiting to be discovered not as conquerors but as travelers with an open heart. In other words: Explore. Dream. Discover Cozumel Mexico. Then share your experiences with the world.